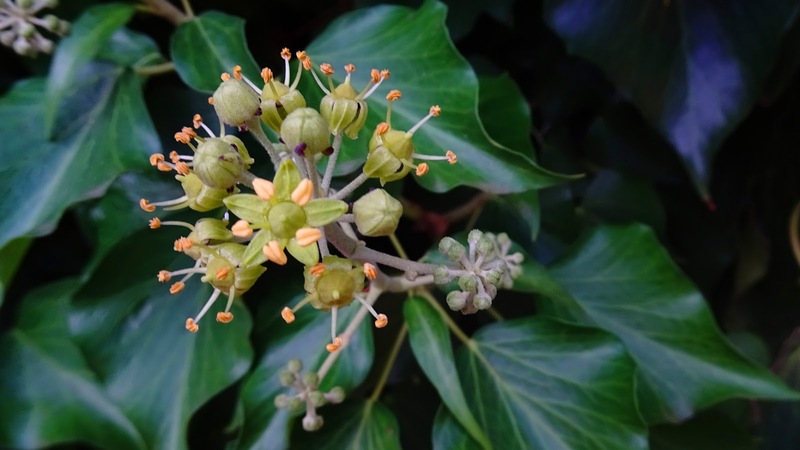 Hedera helix (common ivy, English ivy, European ivy, or just ivy) is a species of flowering plant in the family Araliaceae, native to most of Europe and western Asia. A rampant, clinging evergreen vine, it is a familiar sight in gardens, waste spaces, on house walls, tree trunks and in wild areas across its native habitat. It is labeled as an invasive species in a number of areas where it has been introduced. The flowers are produced from late summer until late autumn, individually small, in 3-to-5 cm-diameter umbels, greenish-yellow, and very rich in nectar, an important late autumn food source for bees and other insects. The fruit are purple-black to orange-yellow berries 6–8 mm in diameter, ripening in late winter, and are an important food for many birds, though somewhat poisonous to humans. One to five seeds are in each berry, which are dispersed after being eaten by birds. BEST WISHES TO EVERYONE FOR THE FESTIVE SEASON! MAY THE NEW YEAR 2019 BE FULL OF HEALTH, HAPPINESS AND REPLETE WITH FLOWERS! Brachychiton discolor is a rainforest tree of eastern Australia in the family Sterculiaceae. It grows in drier rainforest areas, scattered from Paterson, New South Wales (32° S) to Mackay, Queensland (21° S). There's also an isolated community of these trees at Cape York Peninsula. Common names include Lacebark Tree, Lace Kurrajong, Pink Kurrajong, Scrub Bottle Tree, White Kurrajong, Hat Tree and Sycamore. 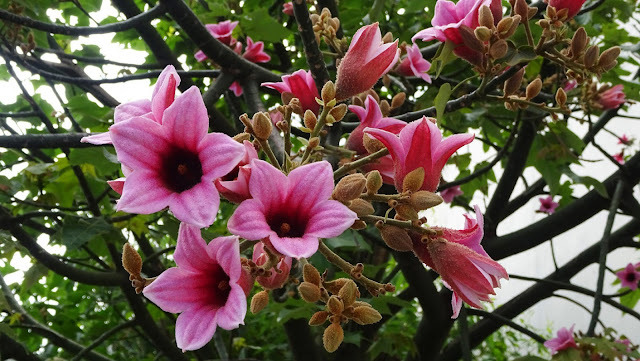 An attractive tree up to 30 metres tall featuring pink flowers without petals. The trunk is straight, grey and cylindrical, up to 75 cm in diameter. Not buttressed at the base. Twigs hairy, brown and smooth. Leaves are hairy; lobed in three, five or seven points, 10 to 20 cm in diameter. Whitish underneath, dark green above. Leaf veins visible on both sides. Flowers form from November to February. The flowers are pink, almost without stalks, 3 to 4 cm in diameter. Separate male and female flowers occur, without petals. The fruit is a hairy boat-shaped follicle maturing from December to July. It is 7 to 20 cm long, containing up to 30 seeds, 9 mm long. Germination from fresh seed occurs without difficulty. It is widely planted as an ornamental tree. Wood used as shields by Indigenous Australians. The roasted seeds are edible by humans. I would like to extend to you my best wishes for the Festive Season. If you celebrate Christmas, may you have a peaceful and happy time together with those you love. Lilium (members of which are true lilies) is a genus of herbaceous flowering plants in the Liliaceae family growing from bulbs, all with large prominent flowers. Lilies are a group of flowering plants which are important in culture and literature in much of the world. Most species are native to the temperate northern hemisphere, though their range extends into the northern subtropics. 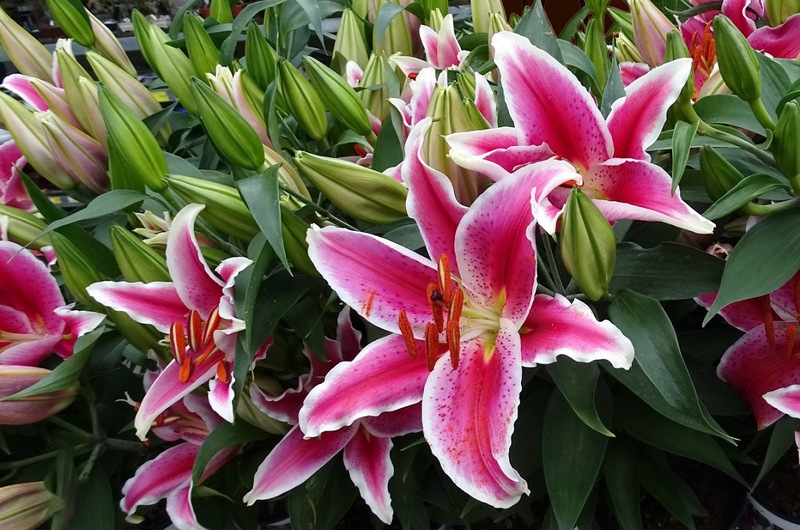 Many other plants have "lily" in their common name but are not related to true lilies. Oriental lilies seen here, are based on hybrids within Lilium section Archelirion, specifically Lilium auratum and Lilium speciosum, together with crossbreeds from several species native to Japan, including Lilium nobilissimum, Lilium rubellum, Lilium alexandrae, and Lilium japonicum. 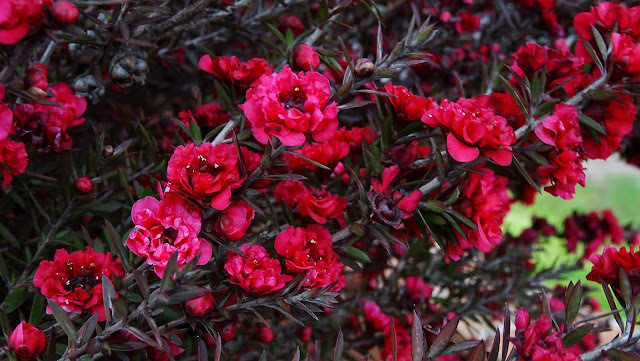 They are fragrant, and the flowers tend to be outward facing. Plants tend to be tall, and the flowers may be quite large. The whole group are sometimes referred to as "stargazers" because many of them appear to look upwards.